Gym memberships surge every January as people recommit themselves to improving their health. While being physically active and eating well are essential strategies to stay in shape, improving your health is just as much about rest as it is about exertion. Pursuing a healthy lifestyle without reassessing your sleep habits will hurt your chances of achieving your ultimate fitness goals. At Silent Night Therapy, we want to encourage our friends and neighbors to get healthy in the new year by committing themselves to better sleep habits. We live in a society where people want to see results. Many people set their fitness goals around an idea of how they hope to look. Often when people make resolutions, they are looking to push themselves, try harder, and do more. We see that over and over again that effort is rewarded. Setting a goal to get better rest challenges us to learn when to stop rather than continue pushing. Committing to better rest involves learning to establish healthy boundaries, to learn when your body needs rest and recovery and to make sure that you honor that. 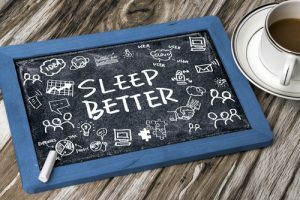 While better sleep may feel like a counter-intuitive way to reach a healthier weight, the reality is that the quality and amount of sleep that you get impacts the food you crave, your mood, as well as your mental and physical agility. Technology ban – Make the time that you sleep a haven from the digital demands of the rest of your day. Reclaim your time by getting into a more grounded routine. Routine – For those looking to improve their sleep habits, consider establishing a concrete nightly routine. This may involve some light stretching, drinking tea, or reading a book. Being consistent with your routine will help you develop a steady rhythm for winding down. Dark environment – Wherever you are sleeping should be dark. Our bodies naturally respond to light, even when we are sleeping. If you have a television on in your room, even if it is muted, the light will affect the quality of your sleep. In spite of the struggles that we may have with sleep, whether it is insomnia, chronic stress, or any other issue, our bodies have a natural rhythm that can always be relearned. We have helped plenty of people who had lost hope that they’d be able to get back into a healthy sleeping habit. This year, pursue your health goals with the understanding that you will be able to achieve more if you rest more. Get in touch with a member of our Silent Night Therapy team at (631) 983-2463 to find out if sleep apnea is impacting your quality of sleep, and how our services could help.